Chapter 61: Let’s Start Embroidering! The contract to become a lady chief embroider was gently placed into the book case. Sitting on a chair with an armrest, Su Shuilian sighed and thought. Could it be fate? From the ‘Su Embroidery House’ to ‘Yue Yun Embroidery Floor’, her life was as if it was completely intertwined with embroidery. Or perhaps, it should be because of Su Embroidery House’s influence on her to be able to embroider so well and thus allowing her to become so successful even in a completely foreign place. Lady chief embroider? Su Shuilian pursed her lips and withdrew her thoughts. Since A Yao allowed her to decide, she will follow through; once she completes <Drunken Beauty>, then she will think about her decision. After opening up the supplies given for <Drunken Beauty>, it was just as Su Shuilian guessed, this piece was going to be used as a dividing screen. Su Shuilian then studied the three sample templates given. All of them were of Yang Guifei*, but each had different expressions and backgrounds. In the first image, she was holding a cup to the moon. In the second image, she seemed to have drank a few cups, seemingly tipsy with as she held her head up, heavy with hair ornaments behind a field of chrysanthemums. The last one, she was being supported and lead into a room, as if to rest. After reviewing the samples, Su Shulian’s first thoughts were that this was going to be made into a six panel screen and not eight. Otherwise the art would be obstructed. 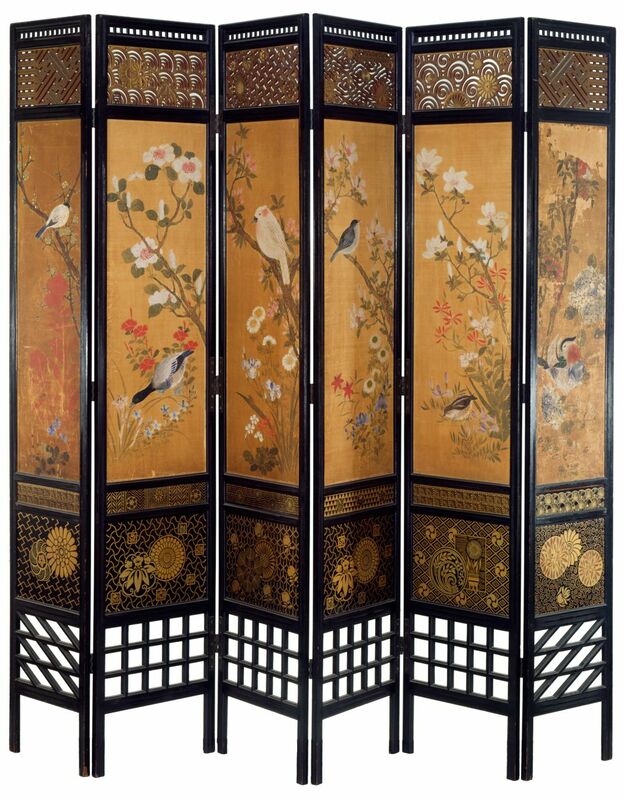 Just, with the embroidery about 5 meters tall, with just six panels, each panel should be longer than the standard width. Su Shuilian held up the samples trying to decide the how to arrange the pieces if it were to be made into an eight panel screen. Compared to this, the previous <Paired Phoenix> was much easier since it was only to be used as a mural. Maybe the embroidery floor was trying to test her? Su Shuilian tilted her head as she thought of this possibility. Normally, when embroidering a screen, there would be a line on the samples indicating where the screen would divide at. However, as a chief embroiderer, not only do they have to know the best suited stitches, but they also have to be able to coordinate proper composition. In accordance to the standards of her previous Su Embroidery House…. Design, sketch, embroidery, and end product, each step of the process were to be judged, and the one with the highest totalled points would end up as the winner of the competition. Therefore, Su Shuilian, as Su House’s legitimate daughter and as the fifth consecutive winner, whether it was design, sketch, or any other aspects of embroidery, she was considered first class. So how could she fail such a small test given by Yue Yun Embroidery Floor? With a thin writing brush, Su Shuilian confidently made small, gentle marks on the sample that only she could understand. Not only did it not ruin the art on the template, it also reminded Su Shuilian of sections that should be left blank as those places would be covered by the wooden beams. The three images were made into eight identical screen size pieces. Of course, Su Shuilian had did it without ruining the amorous feeling of the whole work. There were occasional breaks at her skirt-end, flower petals, leaves, and plant stems, which created a unique flow in the overall image. With a light sigh, Su Shuilian put down the brush; she had finally divided the eight sections. The next step was to start embroidering. The background canvas for the <Drunken Beauty> was a light goose yellow. Hence, there were many colors that could be used in this work. Su Shuilian looked at the threads given by the embroidery floor. There was every possible color sold in the market available. Even the silver and gold thread that she wasn’t able to find was also provided. Was this due to the material benefit of Yue Yun Embroidery Floor? Su Shuilian laughed and shook her head thinking this could be Yue Yun Embroidery Floor’s implication that she was to make the most perfect <Drunken Beauty> possible. What kind of person in Fan Lou City would force them to act in such a desperate manner? Whatever, as this is her love for embroidery, she will do her best. What’s more, she could only rely on her embroidery skills to make a living. Although Lin Si Yao stressed that she did not have to worry about their financial situation. She just needed to pass the time doing (harmless) things that she liked, such as reading, needlework, or even spending time with him…As for the last option, Su Shuilian shyly blocked her ears and pretended she did not hear it. However, she did not want him burdening the responsibilities alone. She was also a member of the family, though she could not plow the fields, could not climb the mountains, or any other rough work, Su Shuilian could embroider. Since embroidery could earn a few taels, but also did not break Lin Si Yao’s prerequisite, of course she would accept to do it. Then that way, she won’t waste the lady chief embroiderer title given to her by ‘Su House’. And so, for a month and a half, Su Shuilian was completely focused on embroidering. Of course, other than her fixed three meals, Su Shuilian took small breaks and drank plenty of water, anything that Lin Si Yao requested her, she obediently complied. Not only because she wanted to look after her health, but also Su Shuilian wanted to continue to have her freedom to embroider. That’s right. While Su Shuilian was sewing the <Drunken Beauty> piece, she had already decided that she would accept Yue Yun Embroidery Floor’s contract and become their lady chief embroiderer. Who wouldn’t be happy to have the backing of such a large embroidery floor? Not to mention, their conditions were so advantageous. To earn a tael every month? What more could she ask for! After living in this house for about six months, Su Shuilian had already learned how large of an amount a single tael was. For her, Lin Si Yao, and their (meat-addicted) wolf puppies, 300 bronze was the rough amount used every month. In other words, with a single tael, it could last them about 3 to 5 months. Moreover, this included the bills for wheat, millet, and other food necessities. Next year, the two acres of fertile land would be ready, the harvests would mean they would spend less on groceries, hence a single tael could do a lot! Thinking thus far, Su Shuilian lightly patted her own cheeks. When did she become so frugal? Can’t she remember that most of the meals that were made were all from Lin Si Yao risking his life to catch! Thinking of how he would always give her the money that Lin Si Yao had earned from the animals he hunted, Su Shuilian could not help but lift the corners of her lips. Lin Si Yao is really hardworking. No matter if it was trivial house matters or if it was working in the fields, he would always do his best. Even Tian Dabao, the disciple he had accepted had grown tremendously because of his dedication. His past achievements were not mediocre. However he was willing to discard his previous identity and accompany her in a remote village as an ordinary and monotonous farmer. She was content. And because of that, she wanted to, with her own hands, make their home more beautiful and rich. In this simple and quiet town, she wanted to have a child with him, and live with him until the very end. Oh my.. She wants a BABY!! Is this foreshadowing?? I’m pretty sure it’s the extended length, or what we’d normally call the width if it was a wall. A little over 16 feet tall is possible, but less likely, with an embroidered screen. oh thanks for pointing that out! I fixed it, as for the first problem…the raws said 5 meters so idk….. :shrugg: ? Thank you so much for the chapter! I seriously can’t wait for them to have a baby. Ah… how can these two be so cute? Awww…. i can see a baby is on its way!! Woohoo!! What a lovely wife and an ideal husband. Thanks for this chapter. YES!!! Two chapter updates…thank you. Hmm where can I find me a hubby like Lin Si Yao???? Im sure the husband is more than willing to try for her. Aww, this couple is just so darn sweet!